Toquerville has recently undertaken the replacement of nearly all of the City’s municipal lighting with LED powered luminaires (light fixtures). The new luminaires operate at lower cost but provide the same illumination as the old ones. They also provide more flexibility in that they can be programmed to operate at a lower level of light output where appropriate and even to change power levels according to the time of night. Most importantly, they direct their light output down to the ground, not upward into the sky. This helps preserve our dark skies. However, municipal lighting is only part of the overall lighting in the City of Toquerville. The City does not presently have commercial lighting and this means the rest of the lighting today is from the City’s residents. To help preserve our wonderful dark skies Toquerville has an exterior lighting ordinance, and it applies to both municipal lighting and residential lighting. 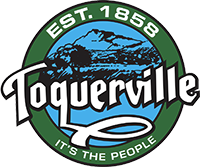 As you have undoubtedly noticed, Toquerville is growing! Toquerville’s dark skies are a precious resource which is easy to lose but would be very difficult to recover if lost. What will our night sky look like in the future? Will there be anything left to see for our children to be inspired by, marvel at, and cherish? Will the wonderment of the night sky be just a distant faded memory for those of us who were once lucky enough to gaze upon it? We can’t let that become our fate. That’s why we need your help. Many communities in Utah are actively reducing light pollution. Torrey is the first to be designated an International Dark Sky Community. Others will be designated soon. Many are working to cut light pollution and protect the night sky, including Boulder, Eagle Mountain, Virgin, Bryce Canyon City, Eden, Helper, Moab, Rockville, Kanab, Heber City, Park City, Garden City, Bluff, and others. Nine Utah Parks are designated and 20 more are working on it. Health: The American Medical Association warned about the detrimental health effects of bad lighting design in 2016, issuing a policy statement about outdoor lighting: warm it and dim it. Scientists are just beginning to understand the negative impacts that excessive nighttime light exposure has on health. The circadian clock, or 24-hour day/night cycle, affects important physiologic processes. Disruption of these processes are associated with sleep disorders, psychiatric disorders, cardiovascular diseases, immunological disorders, metabolic disorders, obesity and cancer progression. Toquerville has a good outdoor lighting ordinance but for compliance we need your help. Energy savings: The most persuasive arguments for dark sky lighting control are economic. In the U.S., approximately one-third of all lighting is wasted. It’s even worse for night lighting. For every $100 spent operating a dusk-to-dawn light fixture, $45 is wasted on light that never reaches the ground. Heritage and rural character: Night skies were important to early settlers. That connection is an important part of our pioneer heritage and rural character in Toquerville. Light pollution diminishes our ability to view and enjoy the night sky. This has subtle but significant cultural impacts, especially for future generations. Quality of life: Nearly 80 percent of North Americans cannot see the Milky Way due to light pollution. We’re lucky. 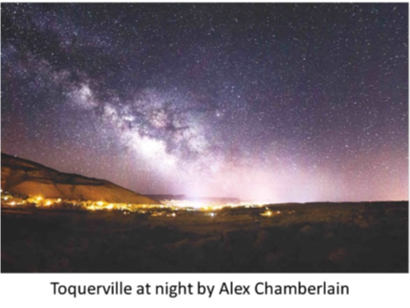 We can still see stars, galaxies, and more in the night sky over Toquerville. A goal of our City’s General Plan is to protect our quality of life by preserving and enhancing the natural beauty of the landscape and the spiritual quality of the environment. Surely that includes the night sky above Toquerville. Safety: Bright lighting does not mean safer lighting. Bright, glaring lights contract the eye’s pupils and create sharp contrast between light and darkness, making the area outside of the illuminated area difficult to see and creates deep shadows that offer concealment. Dark sky friendly lighting will improve overall safety. Lower lighting levels, warmer light temperatures, and better coverage are safer lighting methods. Nature: Humans are not the only ones who are adversely affected by light pollution. Both wildlife and domestic animals are similarly impacted. Prolonged exposure to artificial lighting creates disorientation, alters behaviors, and changes breeding cycles. It disrupts natural processes in both plants and animals. Property values: Light trespass, the unwanted invasion of light, is an issue because it interferes with a property owner’s private enjoyment and use of his or her own land. Dark sky friendly lighting can enhance property values by eliminating light trespass. Due to the scarcity of dark, starry skies all around the county, improving the quality of our night sky helps maintain or even increase property values. Tourism: Places where night skies are free from artificial light pollution have become increasingly popular tourist destinations. Tourism provides local businesses with a steadier source of income, allows for a more efficient use of community resources, and creates jobs for us, our children, and grandchildren. We are fortunate to live in Toquerville, on the way to Zion and other national parks. These pristine, magical places generate no light pollution but are defenseless against invading light pollution from us and our neighbors. It is our responsibility to be good stewards and take the lead to protect these special places. Ask the City or visit its Web site for information about how you can comply with the City’s Exterior Lighting Ordinance. Only use your exterior lights when they are needed. Put your exterior lights on a timer and set them to turn off after 11 pm. Add a motion sensor to your light. Add a shield to your light fixture so that the light goes down where it is needed, not into the sky or into your neighbor’s property. If you can save money, protect your health, protect the environment, and preserve our heritage of beautiful night skies, will you do it?